The UK’s best products and services for plug-in fleets were recognised at the Fleet World Honours this week, including a new category specifically aimed at electric mobility. Judged by an expert panel of Fleet World editors, the 31 categories recognise innovative offers which help cut costs, streamline options and contribute to safer, more fuel-efficient offers. 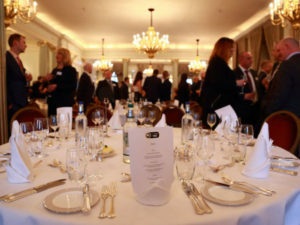 Awards were presented at a winners-only lunch at the Royal Automobile Club on Pall Mall. This year’s event included the inaugural Innovation in Electric Mobility award, presented to Alphabet for its Electrification Potential Analysis tool, which aims to help fleets confidently deploy plug-ins. It uses a GPS data logger to analyse journey patterns and real-world fuel consumption, in turn giving detailed reports demonstrating where ULEVs can work on a fleet. Shoreham Vehicle Auctions, meanwhile, collected the Innovation in Remarketing title for its free training courses to help used car dealers communicate the benefits of electric vehicles to buyers. Developed with the Energy Saving Trust, these help support the historically weak used market, in turn trying to drive up residual values and make monthly payments for new vehicles more affordable. Despite growing competition, Renault’s ZOE collected the Best Ultra-Low Emission Car title for the second year running; with judges praising its near-200-mile real-world range, rapid charging ability and good fit in its segment as reasons for drivers to make the switch. Toyota and Lexus, meanwhile, were presented with the Technology Award for making hybrids a core, competitive part of the business and a great offer for fleets, while also contributing to a 107g/km average CO2 emissions last year, against an industry at 122g/km. Future models were also recognised. Hyundai collected the One to Watch award – presented to products which are set to be game-changers for the fleet sector – for the forthcoming Kona EV. Launching this summer, the judges said it stood to drive even wider adoption of electric mobility by combining a 250-mile range with fashionable SUV styling.